One neighbor described the sound as a big “whoosh.” To me, just rousing myself from sleep at 2:30 a.m., it sounded like something crashing – a ladder against an outside wall or a bookshelf in my son’s room slamming to the floor. It was July 3, and the disaster – whatever it was – woke all of us up. Lights blinked on in various rooms of the house, and my husband, mother and I in our nightgowns and sweatpants rushed to check the house, inside and then out. We couldn’t see anything right away, after going through the different rooms and then walking outside the front and back doors. We even looked over the fence into a neighbor’s back yard, and saw no sign of disaster. But then I ventured further out onto our back patio. It is set against the side of a hill that slopes up behind our house. The light from our dining room shone on the patio, and I could see something unusual: a branch with pine needles lay on the ground, and nearby rested a greenish pine cone. Neither are among the the scattering of oak leaves or twigs that usually wind up on our backyard patio. I looked up the hill, into the dark, above a trellis my father long ago built over the patio. And there it was, in the blue-black light, the outline of some giant hulking thing. My mind flashed to image of a ship run aground onto a beach into a storm, or the bones of some prehistoric behemoth. I couldn't make it up the hill via an established walkway. It was blocked by the tree and its aftermath. I moved around to the other side of the yard and made it to the top part of the back yard. Much of the top part of our back yard, where a redwood tree and apricot tree stood, was now a tangle of branches and needles. A street runs behind our backyard. I walked a ways down it and saw that the downed tree was maybe at least 40 feet long and that its source was at the far end of our next-door neighbor’s yard near the street. The tree had broken off at the roots. Several hours later, after the sun had come up, we joined some neighbors in waking to this strange situation. As it was, my vacation was starting that morning, a break that included a road trip to the Sierras for a wedding and then to Oregon. Fortunately, we immediately discerned that the tree toppling had caused no damage that required any immediate attention. The tree was a Monterey pine, and it had crashed across our fence and probably destroyed the two other trees, though it was hard to see amid all the tangle of branches. It may have also caused a crack in our trellis. But no utilities were threatened, and our house was spared. We called to file a claim with the insurance company, and talked to neighbors, notably those next door who owned the tree. So has begun an interesting journey of trying to figure out who is responsible for the damage to our property and perhaps the even bigger cost of chopping down and removing the tree. Our next-door neighbors feel terrible, and they are good people and good neighbors. They are an older couple, and have been very kind to our family and other neighbors over the years. They said they had been worried about the tree since the spring. That’s when PGE dispatched a company to come out and prune the tree’s branches which had been touching a power line. Apparently, those branches had caught fire sometime in the winter. But our neighbors said the tree company hired by PGE had pruned the branches in a way that made the tree look dangerously unbalanced. Somehow, over the months, we missed all this. Then again, this particular tree, somewhat distant from our properly line, had never been directly visible from our back yard. There were other trees standing in the way. It never seemed to loom threateningly above us or our house. But in getting out and talking to neighbors who live on the street above us, I learned that they, too, had been worried about the tree since PGE's tree-trimming work. And, they, too, thought the tree was leaning pretty precariously. One told me she worried the tree would crash into our next-door neighbors’ house or into ours' in any storms this coming winter. According to PGE's website, its Vegetation Management Department is required by state law to maintain clearances around high-voltage power lines. It dispatches companies to do the pruning work. These contracted companies are described as “qualified” foresters who determine the amount and type of pruning based on, the website says: the tree’s growth and structure, wind sway, species of tree and environmental factors, among other things. “As always, we also include a reasonable margin of safety above the absolute-minimum clearance requirements,” the website says. When we got back from vacation, I called PGE, and talked to one representative who listened, took the information and said she would send out a claim form. A few days later, I received a call from another PGE representative – unfortunately I wasn’t able to hear or write down the department name. This person sounded a bit confused about why I had called. 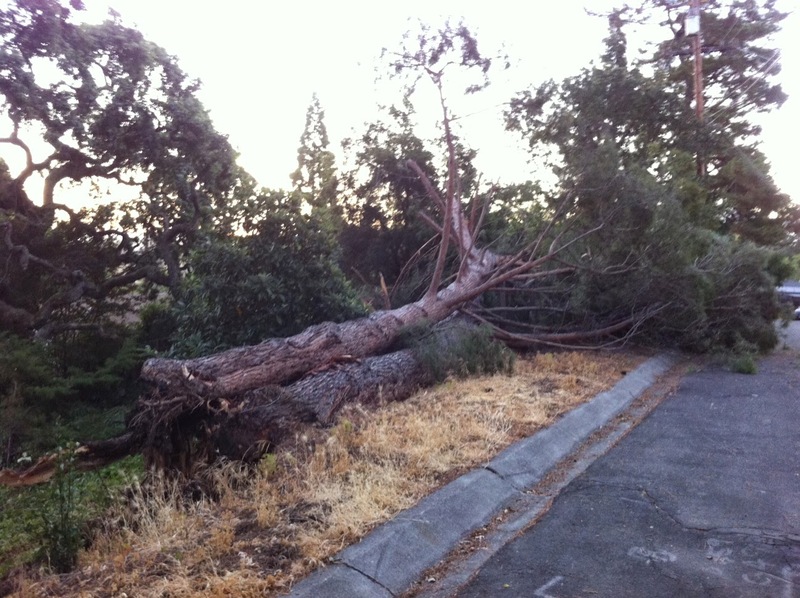 After I explained the situation, she huffed impatiently and suggested that PGE was in no way responsible; our neighbors are responsible because the tree was on their property…. I said I still wanted to file a claim and to obtain records of any work that had been done on the tree. She said little else, other than that there would be a phone record of our call. I suppose that is reassuring -- the paper trail has been established! -- but the more I read about PGE's responsibilities around tree-pruning programs, the more I think pushing them for answers is worth my time. Two weeks since the tree toppling, I've also become worried that the tree could become a fire hazard, as its heap of branches and needles dry out in the hot summer weather. Shouldn't PGE be concerned in that regard? Meanwhile, I’ve heard from our homeowners' insurance company that it may only pay to repair the damage to the fence and to the trellis; but it won’t pay to remove the tree and all its branches. 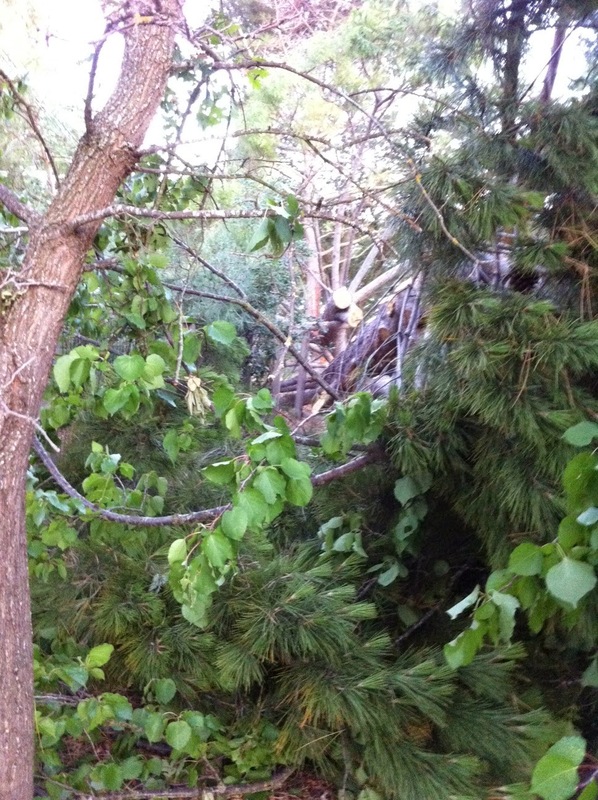 A tree removal company has given us an estimate of $3,300 to do that job. 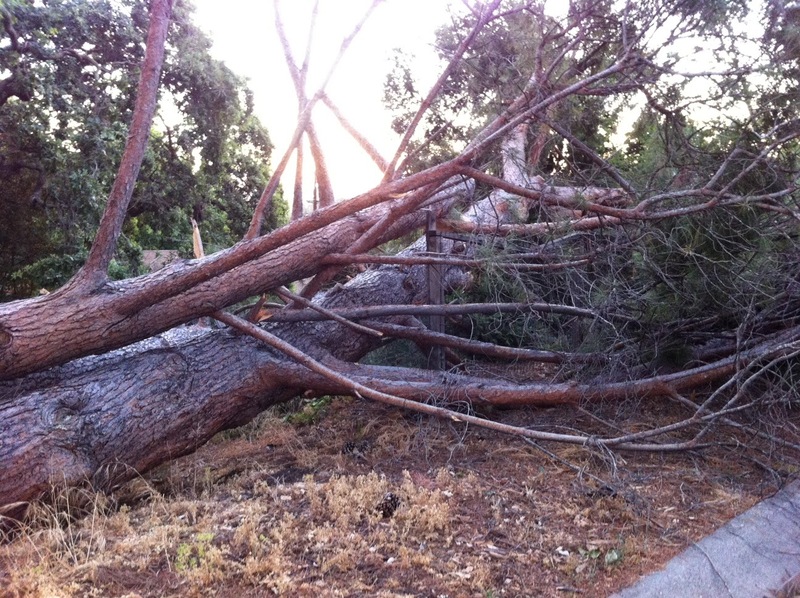 In the meantime, our community could also be dealing with an epidemic of toppling Monterey pines. The Contra Costa Times said last Wednesday a Monterey pine, across the street from Kaiser Permanente's medical campus in Walnut Creek, toppled over and landed on three cars.